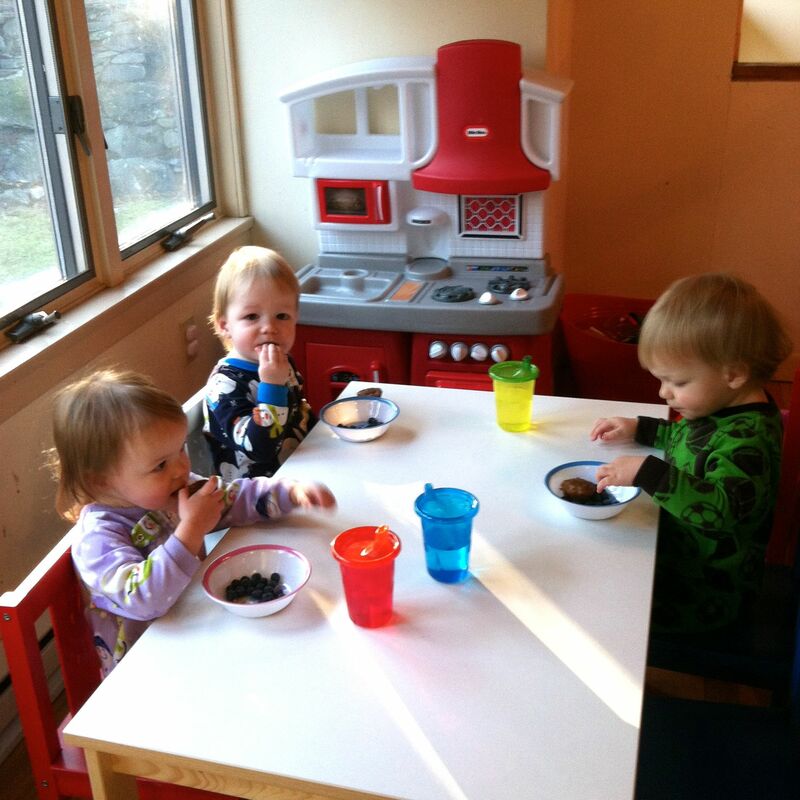 Full Fledged Toddlerhood – sippy cups, high chairs and a potty. We finally got rid of milk bottles. Ok, ok, I know you’re supposed to stop the whole bottle thing after kids hit a year but they just liked them so much and sucked them down in 1 min flat. Over the course of the last 20 months or so I have tried literally every single fancy sippy spout and straw cup available. I’m sure I’ve spent well over a couple of hundred dollars total. I was able to get them to take the Playtex Lil’ Gripper Straw Cups for water but they just refused to drink from them if it was milk. Finally a fellow triplet mom asked if I ever tried the Tomy Take n’ Toss – the cheapest and only one I hadn’t tried to date. I think I viewed them as being disposable and too flimsy? She said the flow was pretty fast so it might work since they seemed frustrated with not getting the milk quick enough from other zippy cups we had tried. Low and behold after 2 days they loved them and I love them because they are easy to clean and cheap. Only drawback is that sometimes my kids will pull the lid off (happens about 1x per week). My kids are getting big (even Evie) and lifting them into their highchairs 3-4 times per day was just becoming backbreaking especially if they decided they didn’t want to sit in their high chair. So, after an impromptu trip to IKEA one weekend I came back with a large, rectangular kid sized table and 6 chairs – 3 for them and 3 for their friends of course! I was a little worried that they wouldn’t stay seated at the table but low and behold after a few days of making sure we removed their plate if they left the table they were “big kid” eating champs! Now, every morning when I say breakfast-time they go running to the table and sit down, patiently waiting for their breakfast. Love, love love! So Calder and Evie like to strip. Luckily Campbell has no interest in stripping…yet. This issue came to a head when (luckily?) I was at work. During nap time Calder decided to take off his pants and diaper (of course after having gone #2). Our au pair, Anna hears “uh-oh, poo poo, bunny” at least five times in a row and decides to check out the situ. Poop everywhere. Fortunately Tim was home sick so Anna called him in for reinforcement. Tim reaches down to get Calder – gets poop all over himself. According to Anna, Tim screamed like a girl and immediately ran to the bathroom to strip in a total panic. We are now gently easing Calder into the idea of the potty (we’ve had the Baby Bjorn potty chairs since Christmas) and watching Elmo’s Potty Time video daily. Any tips on potty training and keeping clothes on toddlers are welcome and needed! This entry was posted in Triplets, Uncategorized and tagged high chair, Sippy cups, toddlers, triplets by triwithtriplets. Bookmark the permalink. Cute photo. It looks very calm and under control – not at all like my house! They are usually pretty well behaved but definitely have their moments. Not sure how old your kids are, but mine seemed to get a lot more manageable at around 20 months. I’m not in a hurry to change from bottles to sippy cups. My trio drink water out of sippy’s but milk from bottles and they are 17 months. I think we might start to transition soon, but really, I don’t know what the obsession is to rush them onto sippys! They look so cute at the table! I think my kids would love to sit at their little table also, they love chairs but we are still in highchairs for the moment. This has made me consider trying out the table for snack time. I think they would be excited at the prospect. As for the table and chairs – we have a table and chair set up in the play area and once they got comfortable getting in/out of the chairs there I knew they were ready for them at the dinner table. Getting rid of the high chairs when you have triplets is awesome. Clean up is soooo much faster.